If you’ve not traveled across several time zones and then been awake when you are supposed to be sleepy and tired when you are supposed to be awake, you can’t appreciate this. The other night I woke up at 1 am and couldn’t go back to sleep! And I don’t normally have insomnia. That’s not one of my problems! We are 6 hours ahead of those of you back in EST in the USA. That’s just enough difference to be annoying! Not being hungry at dinner time and then voraciously hungry at 9:30 at night. Not normal for me. I’ll be glad to see this phase pass. Ooh. The car was in reverse. Whew. Glad I had some space back there before I hit something. And, of course, back to Polish! Trying to get my new phone to accept Polish when I use Swype and not change all my words to English words. Oh my. I am not complaining. Not at all. Just something to deal with. Oh, and it’s chilly here! No more sweating! The entire time we were in the states in October/November in GA, SC, and FL - it was warm, if not hot. I am so happy! I have a reason to wear long sleeves and make quilts!!!! I have been welcomed back to Poland! Weather, language, and everything! A big “to do” for my sis back in FL is the fabric order - that huge order. Remember it? Well, they were sorting stuff today and my son created this pile. He was sorting reds, neutrals (meaning tans/off whites mostly), and other things. 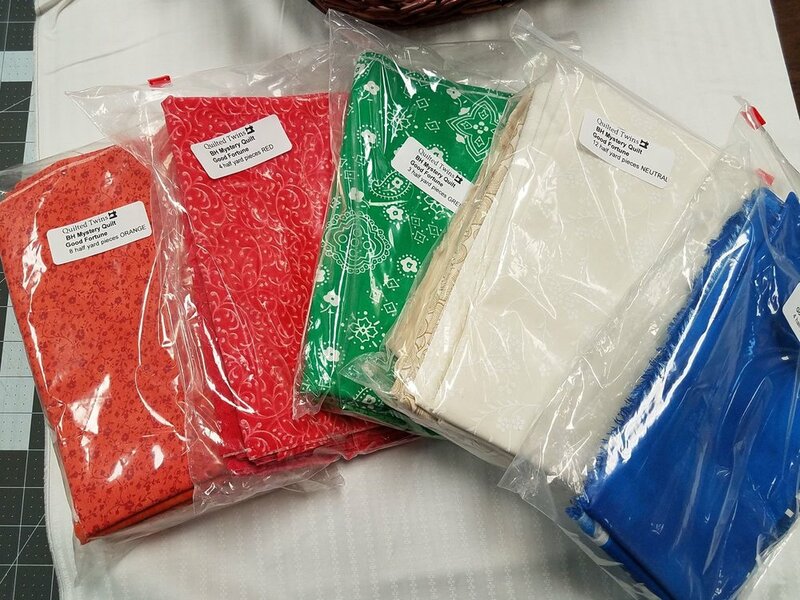 There is still time for your Bonnie Hunter Mystery Quilt fabric package! You all realize my sis put together a wonderful collection of fabrics for the Bonnie Hunter 2018 mystery quilt, right? I only ask because Thanksgiving is coming up really fast and normally she starts giving clues on Black Friday. If you want this, there is time to get yours ordered and have it arrive (probably - can’t guarantee how fast the post office delivers!) But since my sis has worked up a bunch of these packs of fabrics, you should be able to get yours quickly! Very quickly! So even if you got your fabrics late, you can still catch up. It’s not really a race, anyway. You realize that, right? Be sure to tell your friends who might want to do this - especially if choosing fabrics stresses them! We’ve done the work. We went to Lowe’s and got the color cards she recommended and have chosen some really nice fabrics in her colors for you! You can order the whole kit, including shipping to anywhere in the USA for only $97 ($92+$5/shipping). There are a few of those packs going out in this order……….my sis’s son is pushing this load of mail to the van! He’s a little camera shy, though. Soon I’ll be back in full swing here in Poland, hopefully, and be able to share some of what I’m up to as I do it. Be sure to check out what my sis has for you!